Hello, there! It’s been a while, hasn’t it? One of my “New Year’s Resolutions” (really using the phrase loosely, here) was to write more. We’re practically halfway through the year, and this is the first time I’ve really sat down and made time to write. I’m calling this a win. I realized that, in my busyness, I was beginning to miss things. I’ve always been a writer, always kept journals – especially since becoming a mom. While the baby books aren’t completed, I’ve promised myself that one day my Ziploc bags with locks of hair and little scraps of paper with notes like “Grant first step 3/18/16!” will become coherent sentences in the future baby book I will finish (after I purchase it, of course). But when there’s been too many months absent of writing, I start to feel untethered. So I’m making a semi-conscious effort (let’s face it – all moms are semi-conscious on a daily basis) to write just a little bit more. When I sat at my desk yesterday, I realized there were some items in my pockets. I pulled them out one by one, and found they were the boys’ treasures they’d collected on our walk from the parking lot to their preschool entrance that morning. Two rocks, a few leaves, a snail shell, and half an eraser. The boys always hand their treasure to me for safe keeping, until I pick them up in the afternoon. My purse is frequently filled with similar treasures, along with Matchbox cars, socks, and Legos. Once a week, I empty the bag to gather the treasures, surveying the week’s adventures. I am amazed that children can find just as many interesting things walking to the preschool entrance as they can during a trip to the park. Isn’t this the beautiful thing about childhood? The wonder and adventure of it all? Sometimes I’ll forget to take these things out of my pockets, and the laundry will end up full of leaf fragments. Sometimes someone will put half an uneaten sprinkle cookie in my purse. Almost always, the cookie goes unnoticed, until I reach in the bottom of my bag to find something and come up with a handful of crumbs and sprinkles. Childhood is also full of surprises. The boys are 4 and 2 now, and it’s dawning on me that we’re entering a new chapter. This is the twilight of the toddler years. Soon their independence (and size) will keep me from carrying them. You can sense the change in seasons through the way the boys talk and play, the questions they ask, and the things they learn and share. Miles will talk to you about endangered species, while Grant will show you how high he can climb by himself. Offers for help are more often turned down, because “I can do it myself, watch!” The little hands that could once only hold my finger now have a firm grasp on my hand when crossing the street, reminding me to “stop, look, and listen.” The soft baby hair that once fluttered like down in the breeze now sticks up wildly and in every direction, sweaty from an afternoon of boys’ adventures in their make-believe pirate ship. The tiny people whose grapes I once sliced in half now open the refrigerator, find a snack, and help themselves. Gone are the days of airplane spoons and booster seats. So I’ve told myself to stop; to pause, to soak it all in, because we’re growing up. Every time I hear Grant say, “Uhm-a-no, door!” or “yeyyow nana!” I want to remember that moment, because soon he’ll be able to say, “Open the door!” and “yellow banana!” and I’ll miss those mispronunciations. When Miles ask for help writing his letter “S” because it really is tricky to master, I have to watch and take in his concentrated face and efforts, because one day he’ll be typing his term papers. When the boys ask if we can build just one more fort, I’ll drop everything I’m doing to help, because one day they’ll be constructing all on their own, with no need for mom to get to the things they can’t reach. I’ll miss those pockets full of leaves. I’ll miss finding rocks hidden in my shoe, and Batman figures stashed in the vegetable crisper. I’ll miss overflowing bubble baths, putting socks on their feet while they’re sleeping, and turning off the nightlight. Every age is full of magic. Every age we reach, I think to myself, “this one, right here – this is my favorite age” because the truth is, these tiny beings are incredible, wonderful, amazing people, growing into incredible, wonderful, amazing young men. I treasure the beautiful series of moments replaying in my mind, from first steps, to learning to brush our teeth on our own, to putting on their shoes by themselves. Yes, Ferris Bueller was right about life, and it moving pretty fast. Take time to stop and smell the roses, even if they’re covered in strawberry jelly and glitter, because one day, you’ll miss this. 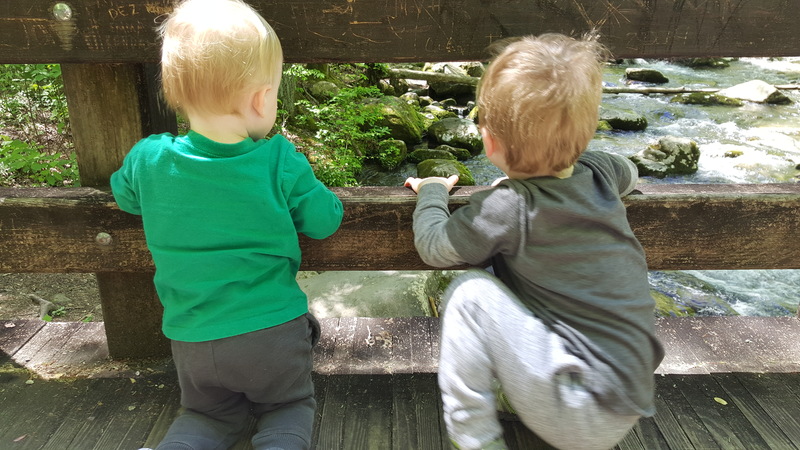 kristin at hysterically ever after • This entry was posted in Family Time, Mom Stuff, Parenting and tagged boy mom, childhood unplugged, let the kids. Bookmark the permalink.